TheMediagoon.com: Mets: Hawaiian Punch Hit Towel?? 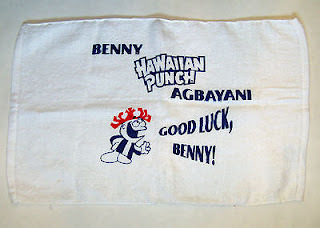 This bid is for a New York Mets Benny Agbayani Hawaiian Punch Rally Towel AT SHEA Stadium. Was "FAN GAME USED"! I don't rate/ grade items. Look at the photos. It looks good to me! This is a great historical item for any NY Mets collection.